Is “push to add drama” truly the best ad? Yes, for the agency. Do you remember how TNT Benelux launched? Odds are high you don’t even know what I’m talking about… (based on small-scale research, see below). (based on small-scale research, see below). Do I love the ad? Hell yeah! Do I believe this is the best ad in the world? Hell no! For which brand is this video made? For which newly launched TV station this video was aired? Tip: logistics, explosives. Have you watched TNT Benelux? In general people don’t recall the brand promoted through the viral video. Even when I provided extra tips to them: “explosives (=TNT)” & “logistics (=TNT)”. Consequently it shouldn’t surprise that only 1 out of 35 respondents watched the channel. Within my respondents nobody went to see the website of TNT Benelux. 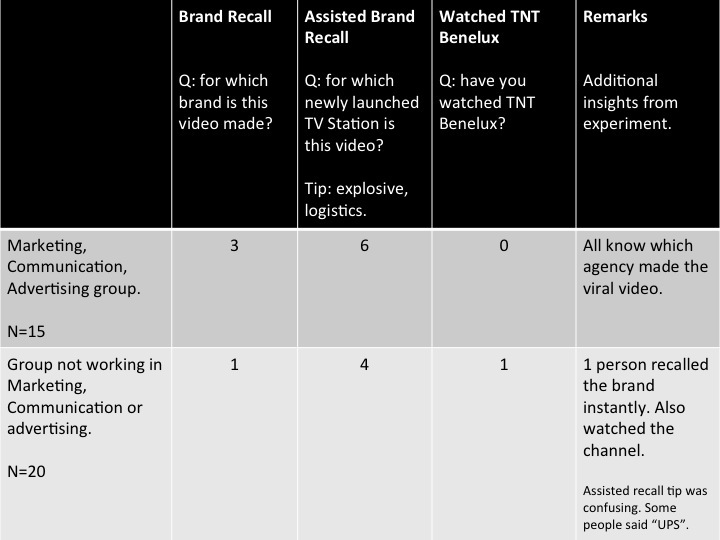 The most striking thing however is that the “Marketing, Communication, Advertising Group” of respondents basically all knew which agency made this ad / viral movie. And today, they’re all dreaming about a collaboration with that agency. It was the best ad in the world. For the agency that is. What’s your view on viral advertising by the way? Whispering Web – The Book. I’ve made your life easier. Well, I made it easier if you were to read everything ever posted on this blog. Consider how many clicks that’d take. At least a thousand, right? Below is a book that collects all articles written in the first year of this blog. Reading all articles in this manner will take you about 70 clicks. I saved you just about 930 clicks. And I might argue that 930 clicks require at least 2 doctor visits because of a painful wrist. I’m not a doctor price specialist but I believe two visits quickly will cost you about 50 EUR or Dollars. Hope you enjoy slide-reading through it.